Establish habits and routine to help minimize mistakes. Mistakes happen in day trading. They often occur because too much information is coming in at once and you feel overloaded, panicked, and aggressive, or they often occur during quiet/bring times when your guard is down. And of course, there are always random mistakes, such as hitting the wrong button – buy instead of sell – or putting out the wrong position size. Such errors can even happen with automated strategies. Before every trading day take a few minutes to go through a day trading routine to help minimize errors throughout the day. Here are the steps I go through. Depending on the market you trade, you may wish to add a few additional steps. This whole process only takes a couple of minutes but saves you a lot of frustration and money. High impact economic events can cause price spikes/gaps, creating significant slippage (the difference between the price you expect and ​the price you get) on stop loss orders. It's best to avoid being in trades for the few minutes surrounding high impact scheduled news event. 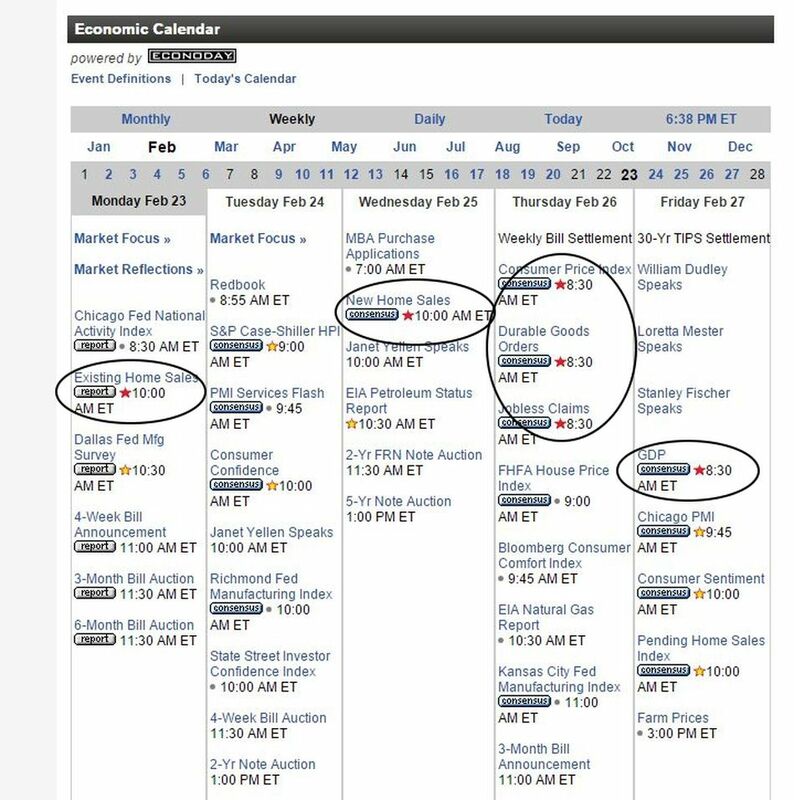 Check your economic calendar before trading, and note the high impact news times. For U.S. stocks and futures, you can use Bloomberg. For Forex, check out the DailyFX economic calendar. If you trade individual stocks on a regular basis, check the company doesn't have earnings or other announcements due out that day. The Yahoo! Finance earnings calendar works well. Be aware of these times, to avoid trading right before the announcement. Launch your platform. Make sure quotes are streaming (not lagging or sporadic) and the program is running smoothly. Most brokers provide reliable data feeds, but problems can arise. If the data feed is intermittent or seems inaccurate, don't trade until the issue is fixed. If it looks right, proceed. In MetaTrader and NinjaTrader (for example) you can log in to multiple accounts using the same platform. Make sure you are trading the correct account. Be especially vigilant if you practice day trading in a simulated account, but also have live accounts. You don't want to have a great day, only to realize you traded in simulation instead of with real capital. If day trading futures, make sure you are trading the correct highest volume contract. Be aware of expiration dates on the contracts you trade. On your chart, put text notes stating when high impact news releases are. If engrossed in a trade you may forget about one of these events, and it could cost you dearly. Write it down on your chart. If the event occurs later in the day, scroll over and put the text note near the approximate time of the announcement. That way you will see it when the time comes. Even if you day trade manually, you may have some automated orders. For example, in NinjaTrader and MetaTrader, you can send out stop loss orders and targets the moment you enter a position. Make sure these stop loss orders and targets are set appropriately. If trading with a "robot," make sure all settings are accurate before starting it. If you trade with a default position size, make sure it is set appropriately. Adding an extra digit to a position size could spell disaster. Dropping a digit means you trade a fraction of what you could have, and you miss out on an opportunity. If you manually adjust your position size based on your entry point and stop loss locations, note your account balance before trading. Proper position sizing limits risk to a small percentage of account capital, such as 1%. If you have a $35,000 account, you can risk up to $350 on a trade. Keep this maximum risk in mind throughout the day (or write a text note on your screen) to remind yourself this is the most you can risk on one trade. See Determining Proper Position Size When Day Trading Stocks, Futures or Forex for more information. Remind yourself of your problematic tendencies, and how you will handle those situations should they arise. Go over your Key Trading Thoughts (see: Weird Trading Psychology Tip to Improve Day Trading Performance). Make a quick assessment of trading conditions so far. Is the pre-market showing a lot of volatility, or is it sedate? Is there a trend or specific tendencies you notice? Such an assessment lets you know how to proceed, and whether you should be trading your system at all. This is especially important if using a subjective system – a system that varies slightly based on market conditions. For example, in volatile conditions, you may have a larger expected profit target than on a day when there is almost no volatility. See 4 Things To Know About Every Trade You Take for more on this topic. You're set to trade. This process should help eliminate some mistakes related to position size, trading the wrong account/contract, trading during news or just not preparing your mind to trade. As you start looking for potential trade setups, keep your Key Trading Thoughts in mind. This will help keep you out of bad trades (ones not in your trading plan) and keep you alert and ready to pounce on good opportunities (see First Three Goals of a Day Trader). If you notice a time of the day you trend to give back profits on a regular basis, write a note to yourself to stop trading at that time. Many day traders tend to lose money in the time surrounding (and including) the New York lunch hour, if trading U.S. markets. If you notice this tendency, don't fight it. Stop trading during segments of the day you typically lose money. Remind yourself of this when you begin trading each day. Your day trading routine may vary slightly from this, depending on your trading style and the market you trade. Create a routine though. It only takes about a minute or two to go through, and can save you from a lot of frustration.